Sometimes pain doesn’t settle with Physiotherapy alone and in those situations, we have the ability in clinic to deliver injection therapy. We use injection therapy alongside our Physiotherapy practice and this gives you the opportunity to engage in full rehabilitation and get back to fitness sooner. Both Phil Williams and Richard Craig have a wide range of hospital based experience in Injection therapy and have both completed the Society of Orthopaedic Medicine Post Graduate Diploma in Injection therapy. When indicated, injections of steroid and local anaesthetic can be very effective in reducing joint/ soft tissue pain and dysfunction allowing you to fully rehabilitate. In addition to steroid injections, we also offer injections of sodium hyaluronate (Ostenil) for joint and soft tissues. 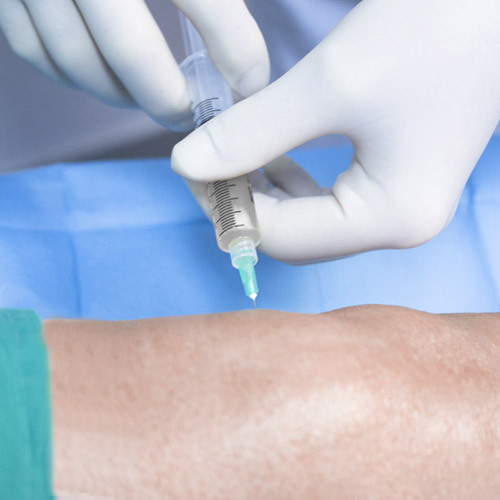 This injection can increase the viscosity of the something called synovial fluid within the painful joints and soft tissues helping to restore its lubricating, shock-absorbing and filtering properties. In addition, it re-establishes the protective coating over the inner surface of joints. The result of this can be a reduction in pain and inflammation of the joint’s membrane, allowing for freedom of movement and reduced pain levels. There is no GP referral required for this service and prior to any injection your Physiotherapist will undertake a thorough assessment of your problem, current medications and your past medical history in order to make a judgement of whether or not you would benefit.